I would be considered quite the novice when it comes to beer drinking. I’m still learning which ones I like and how not to be full after two. What can I say, it’s all still new to me, I’m a wino wine lover. 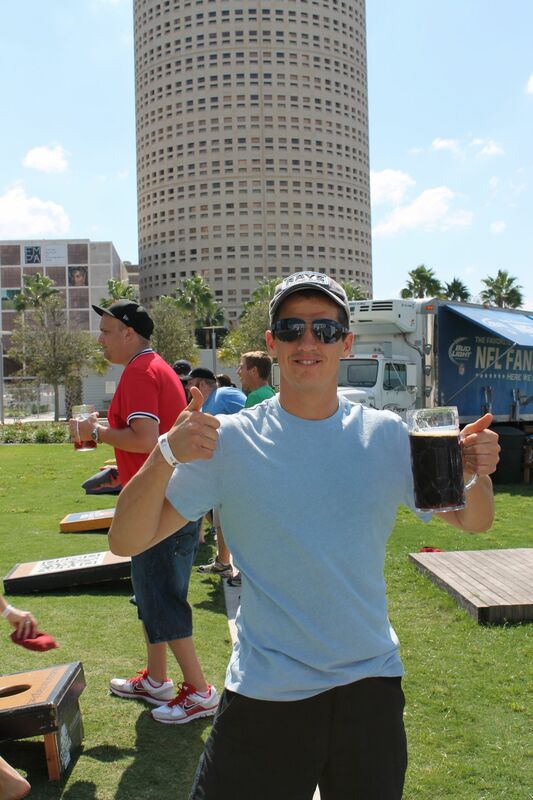 When I saw a beer festival in downtown Tampa that included not just beer, but music, games and costumes though, I had to check it out. 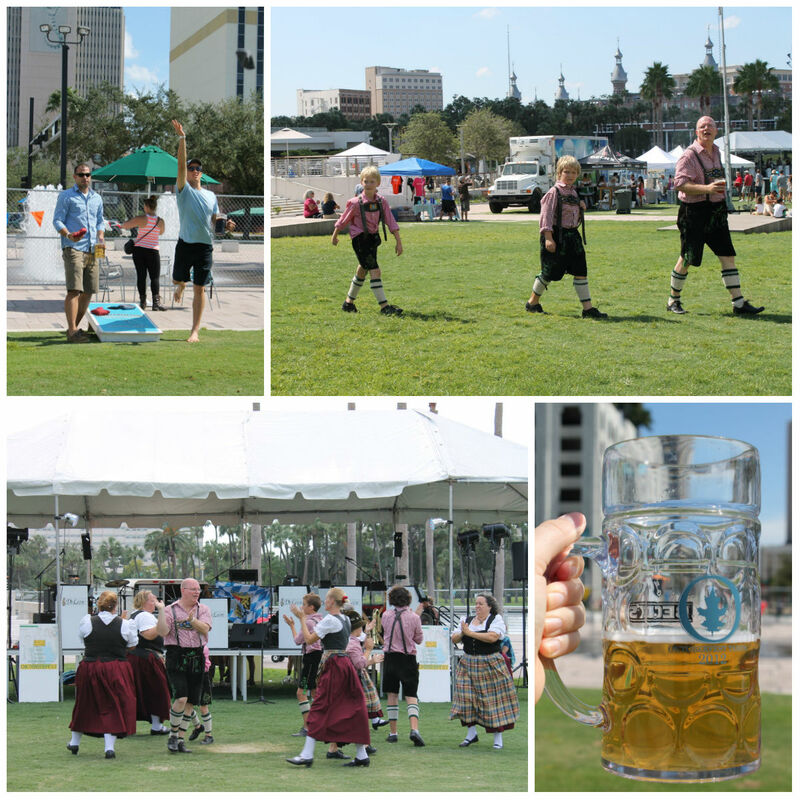 Turns out this was no mere one-off event, but a three day Oktoberfest festival! 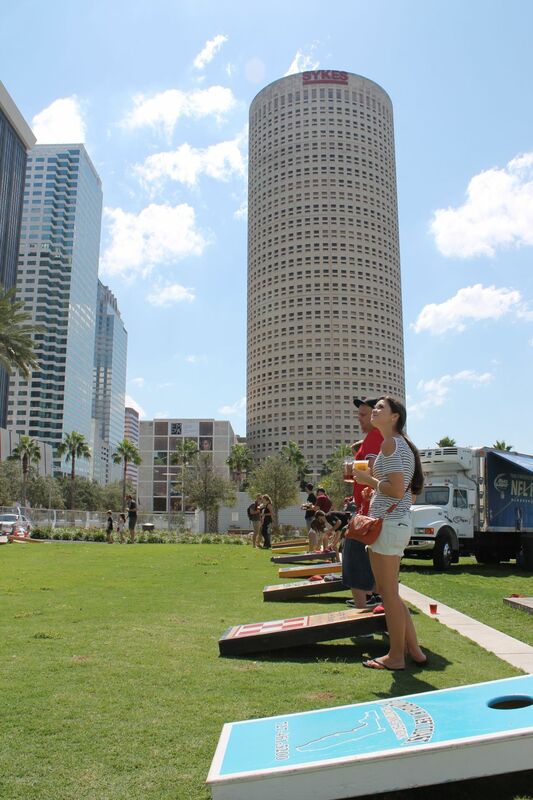 It was pretty easy to persuade Nick to go (the mention of beer and games was enough), so this past Saturday we headed on down to Curtis Hixon Park to see what this shindig was all about. We arrived a bit on the earlier side around noon, but it didn’t take too long for things to kick up. Nick and I met up with a friend and quickly headed to purchase our souvenir beer steins (which turned out to be worth the $10) and fill up. Since I didn’t want to overdo it, I opted for a “Rattler” which is a half beer, half soda, and it was surprisingly tasty! Steins in hand, we quickly spotted and headed straight for the corn-hole boards for a couple games before the crowds really set in. 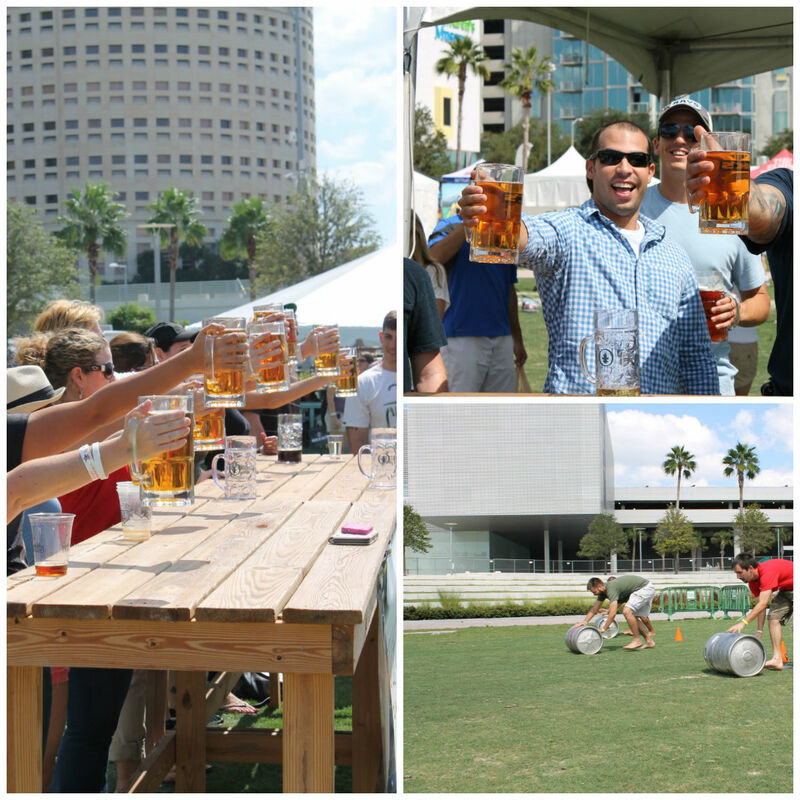 In addition to Corn Hole, they had Wench Carrying, and Sack Tossing, but the most popular was the Stein Hold. One of our friends actually tried this and though he started out smiling and laughing his face looked more pained five minutes in. Men and women had separate contests, but both did surprisingly well. The last Stein Hold we watched was a record breaker for the men with the last man standing, stein full of beer, for a total of 18 minutes. Can you even imagine holding a 4-5 pound weight straight-armed for 18 minutes? Crazy. After about three hours of playing/watching games and enjoying our beers, the sun started to take it’s tole so we headed out with smiles on our faces. Though you may not think so, it was actually a bit exhausting being out in the sun walking around, so we only had energy for a movie that night. We saw Looper, which I thought was refreshing for its different storyline, but kind of slow overall. 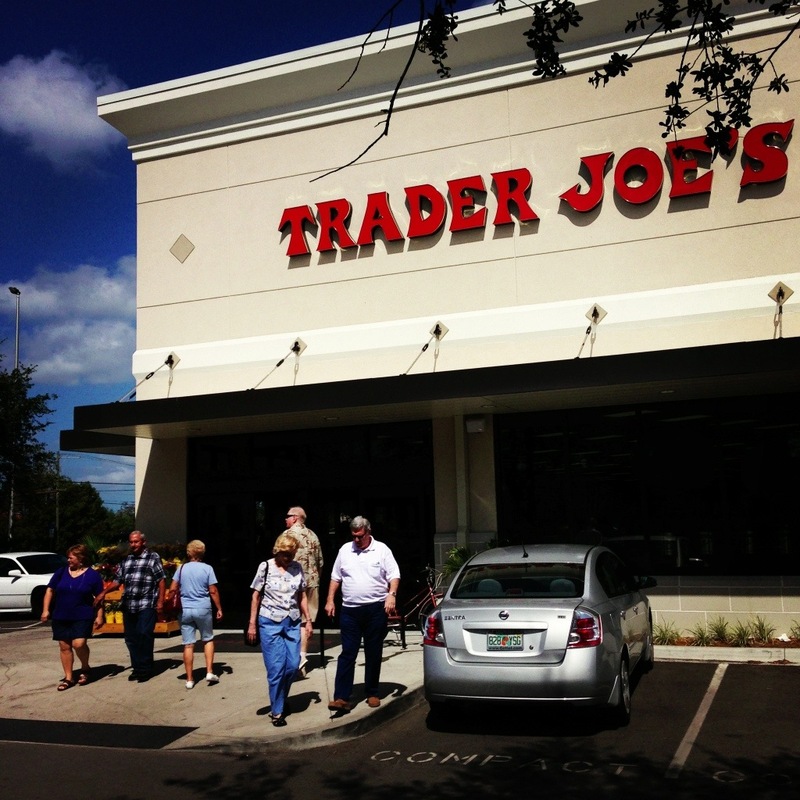 My real excitement came on Sunday though, when we drove down to Sarasota for none other than the legendary grocer, Trader Joe’s, which opened there about a month ago (it keeps getting closer, but reports confirm they have no immediate plans to open in Tampa). It’s about an hour from Tampa to Sarasota, but for a Sunday morning, it was a beautiful and pretty painless drive. We arrived to a packed house with policemen outside directing the parking lot traffic (which I saw in Naples too when that store first opened – weird). 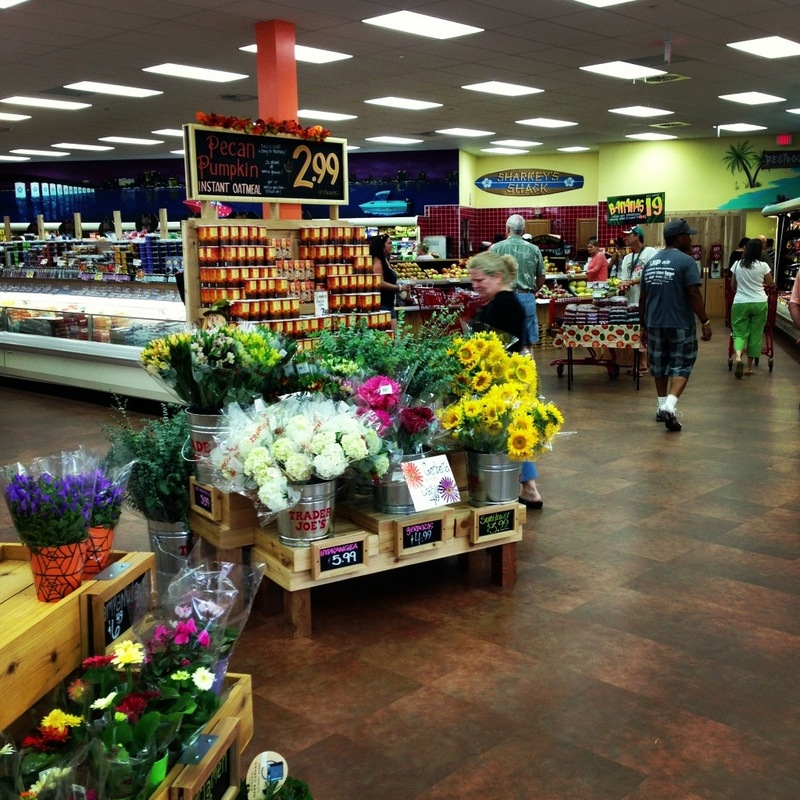 Can I just tell you how nice it was to step inside a TJ’s again? It was like coming home. Those familiar stacks of special products and big displays of flowers were a sight for sore eyes. Even though they were packed, I quickly zipped through the aisles and gathered up my favorite items and a few newbies. I was in and out in under 30 minutes. Impressive, huh? I left with two reusable shopping bags chocked full of food, which I estimate will last me about a month. Now that I’ve done the trip though, I feel confident that I can handle making the two-hour round trip once ever month and a half or so. What’s the farthest you went for groceries? Or for any other commonly needed product?